The world of tea is already complex enough, with all kinds of terminology flying around, so it’s small wonder that terms get a bit…uh, rather jumbled. The bad part is that it causes confusion for many who may not have a level of knowledge to help them distinguish one thing from another. By far the most rampant egregious tea term usage is “Chai Tea.” It’s everywhere. And it’s the sort of thing that makes my teeth hurt when I see it, the way the sound of fingernails on a blackboard does. Some of you may be asking, “What’s wrong with ‘chai tea’?” The fact that you ask is what is wrong with the term. It is so prevalent that few know what “chai tea” really is. Most of us think of it as that tea available mainly during the Winter holidays and with a predominantly cinnamon character to it. In reality, “chai” is another word for tea. See some more of these words here. Speaking of cinnamon, that’s another term misusage but not strictly a tea term, so I only mention it here as a side note. Much of what we know in the U.S. and Europe as “cinnamon” is actually a similar plant called cassia. The difference matters mainly to those trying to take advantage of various health benefits that true cinnamon is supposed to have and that cassia does not. See my article here. Another term that raises the hairs on the back of my neck is “red tea” when it refers to Rooibos (“redbush”). In reality, “red tea” is the Asian name for what we call “black tea” – fully oxidized Camellia sinensis leaves. Rooibos is a completely different plant, as shown in my article here. “Herbal tea” can be just as bad, causing unending confusion for folks who need to avoid caffeine and are advised by their doctors to avoid tea. Many of these herbals have no caffeine. So the manufacturers have to add “caffeine free’ to the package that is already crowded with other data of questionable usefulness. Tea Room applied to a corner of a small restaurant is another horrifying spectacle. Doesn’t a room have those tall, solid, hard things? I think they’re called “walls.” In general, the term “tea room” is getting totally overused to the point where people just attach it to the name of their eatery to add what they think is a touch of class. See my article here. 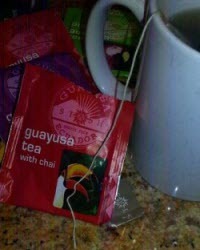 But the most egregious thing we’ve seen so far is a photo of a teabag in a mug with a packet beside it labeled “Guayusa Tea with Chai.” Egads!! The issues: Guayusa is not tea but rather the leaves of a holly tree (ilex guayusa) from Ecuador in South America (and it does have caffeine); and chai is tea, but in this case they are using it to mean spices (which are not specified). Just heaping on the tea terms there – possibly a way to get on the tea bandwagon. a very good blog ..yes, the terminology does seem to get muddled…”herbal tea” … “high tea” is another terminology that is generally misused .. Constant misuse of terminology of tea & the buzz words are the new slang for tea, BTW that tea is from a Major Brand and also it was quite tasty. Thanks for sharing!